The death of a young student just reaching his prime is always tragic. The death of a young black man, especially one only days away from college graduation, is an enormous heartbreak. But the death of a young black man allegedly at the hands of a suspected white supremacist, brutally stabbed merely for being black, is unimaginably sad, to a point where it’s very hard to find the words to describe it. But what strikes many of us as equally tragic is the rush to classify the death of Richard Collins III as a hate crime rather than the instance of domestic terrorism that it really is. Bowie State Honors Richard Collins III, Student Killed at University of Md. Certainly, all indications point to hate as the motivating factor. Law-enforcement officials are still investigating. But calling that moment a “hate crime” puts the untimely and inexplicable killing of Collins into something isolated, infrequent and somewhat unusual when we already know it’s not. Instead, it’s essential that we begin seeing these types of incidents for what they are: acts of domestic terror instigated by the revival of sophisticated white supremacist networks. As a society, collectively, we typically waste little time in using the term “terrorism” to describe tragedies in places like Boston; Orlando, Fla.; and San Bernardino, Calif. Even when there are acts of “lone-wolf terrorism” inspired by terrorist organizations abroad, law enforcement and the media are quick to apply that classification in ways that elevate our sense of alertness. Ultimately, it spurs us all into action and a need to maintain public safety for ourselves, our families and our children. For some reason, it’s very difficult to apply the same standard of urgency and general alarm when the victims of racially motivated or ideological terrorism are black citizens. We found this same hesitancy right after the horrific massacre of nine black congregants, including the pastor, of Emanuel African Methodist Episcopal Church in Charleston, S.C.
It’s still terrorism. 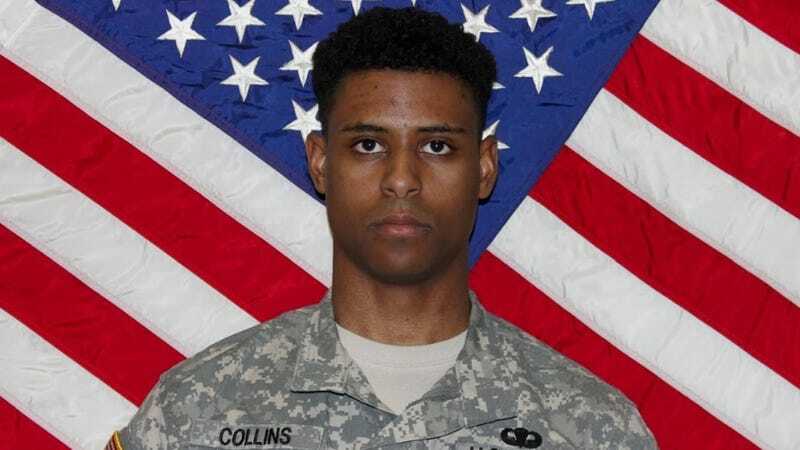 Even more significant is that Collins was a commissioned military officer at the time of his death, a detail that should warrant additional concern from federal authorities. Collins’ alleged killer appears to have been motivated by extreme political viewpoints, and it’s both confounding and concerning that law-enforcement officials don’t consider acts of violence by individuals aligned with organized white supremacist networks to be on the same level as organized terrorism. Whether domestic terrorism or foreign terrorism, they still share some of the same fundamental behavioral characteristics. This is much more than an intellectual debate over semantics or a professorial war on words. It’s about the need for media and governing institutions that lead discussion and awareness of these tragedies to elevate their importance and, thus, spur better community response against dangerous acts of racism that target historically vulnerable populations. Changing that language also recognizes, and addresses, a fresh and virulent pattern of vicious racism happening right now, especially in the wake of the recent election. In the Washington, D.C., metropolitan area, where Collins was killed, we’ve seen an increase in these incidents despite the large and very diverse communities of color living in the region. Before Collins, there were reports of incidents ranging from scrawled racist epithets aimed at American University’s first black student body president to a hanging noose at a Crofton, Md., middle school; from swastikas spray-painted on local synagogues to profanity scrawled across the home of a Northern Virginia Muslim. In D.C. alone, there has been a 62 percent increase in reported hate crimes. Overall in the United States, we’re seeing an explosive increase in these types of incidents and much worse. The pattern is too pronounced to just keep minimizing them as isolated hate crimes. The Center for the Study of Hate and Extremism at California State University in San Bernardino found that these hate-filled acts increased 20 percent last year. That same standard should be applied to the Collins case. Unequivocal stands from law enforcement—and media—on the definition of terrorism send a clear message not only to individuals looking to copy those acts but also to organized racist networks actively targeting people of color. Ultimately, that’s not just a play on words. Indeed, it’s a major step toward forcefully shutting down those networks and saving people’s lives. George H. Lambert Jr. is president and CEO of the Greater Washington Urban League, a nearly 80-year-old organization serving communities of color in Washington, D.C.; Montgomery County, Md. ; and Prince George’s County, Md. Follow the Greater Washington Urban League on Twitter.